Description: Have you ever dreamed of designing an entire makeup line? Now you can create a new pallet of makeup for Jessie, using this wondrous make-up machine. You can combine the fruits and flowers to make any color you can imagine for lipsticks, eyeshadows and hair dye. 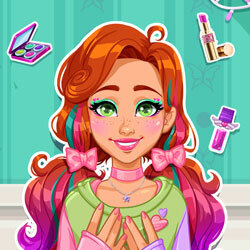 Add some glitter and shine, and create the prettiest makeup ever!